Having recently returned from a late summer vacation in Europe, my mind’s a blur with the centuries-old architecture, artworks, and monuments that serve as inspirations and reminders to millions. It’s easy to regard many of these as perfect examples of careful planning, conscientious execution, and ongoing inspiration—exactly how we’d all like our writings to make their way into our readers’ hearts as important and meaningful. But Germany provided five lessons that stood out on this trip. Maybe they’ll speak to you as well. 1. Progress takes time. 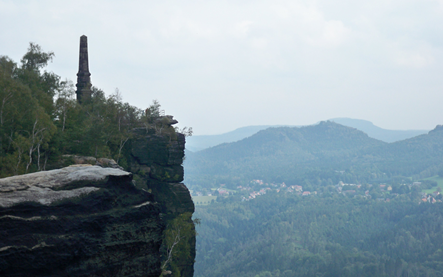 One of the loveliest areas in Germany is the Saxon-Switzerland Mountains south of Dresden along the Elbe River. Similar to America’s Grand Canyon in how they came to be, these Sandstone Mountains were formed over eons as water eroded away surrounding ground and rock. Like some authors’ writing processes, there was no rushing these monumental table mountains. Practice a writer’s patience. Allow your story to form as it will or your information to build upon itself. Rushing can result in cracks that require even more time to fix. The results are worth the work and the wait. 2. Be inspired by those who have passed before. I participated in a work project in Stadt Wehlen, one of the towns along the Elbe River. Our group took to clearing overgrowth from an older section of the parish cemetery. After a day of cutting, raking, and clearing, we found several beautiful gravesites that had been covered over by time and neglect. As a writer, you’re hopefully a reader, too. Shake up your reading list by returning to the classics and (re)discovering a masterwork. There is beauty and inspiration to be found on dusty shelves. Pick up something new to you and different than your contemporary reading list. 3. The path isn’t always straight. Living in these United States nothing better illustrates the path between two points than a straight street. Being from (flat) Nebraska, grid patterns are often the norm in our city maps. Not so in the hilly countryside of eastern Germany. Roads follow contours: mountains, valleys, and rivers. There’s great beauty in the journey. What feels like a longer way is often the most direct route. Let your writing and publishing journey take you where it will. Be patient and soak up experiences along the way. Your work and rewards will be all the richer when your books find their way home. 4. The rewards are worth the struggle. On my first afternoon I was treated to a challenging hike up the steep trails to the top of Lilienstein (above), one of the striking table mountains overlooking the Elbe River and across from the Königstein fortress on the other side of the river. I don’t have a lot of opportunities for mountain hiking in Nebraska, so it was a nice trial by fire, trekking several switchbacks to the top of this 415 meter plateau. The payoff of most difficult climbs is a satisfying view. Struggle onward and upward to reach your goals. Every ache and pain can be eclipsed by the success you achieve. No matter how high you climb, the view is worth it. 5. You’re never alone. On a day trip to Prague, our hosts were asked directions by some other visiting Germans walking near the Prague Castle complex. They happily shared information and directions. I’ve found this the case on every trip to Europe. If they can, anyone will help you find your way or get you back on track. This sure reminded me of home, too, where I find Nebraskans seem genetically engineered to help when asked. Whether you’re writing or indie-publishing, there are great resources and helpful people willing to shed light on several paths to get where you want to go. Don’t let apprehension keep you from the path, be it an uphill climb or a long walk. Nothing is better than the destination—and the view of your book in your hands. From idea to finished book, your publishing journey is going to be thrilling and challenging and confounding. There’s help at every step of your process. Enjoy the journey. Take pictures!